Hey shop owners. Welcome to yet another edition of Car Count Daily. My name is Ron Ipach, but you can call me Captain Car Count because for the past 20 plus years, I’ve been helping auto repair shop owners just like you to get and then keep all the top quality customers that your shops can handle. Today’s episode all revolves around a phone call that I got yesterday. It’s unfortunate because it’s a phone call I get a lot from auto repair shop owners. You get a desperate client on the phone saying he needs to get car count right away. Something went wrong and his auto repair marketing wasn’t working, so he needed to do something to turn a switch on to get the flood of customers coming to his shop. Look, I get it. It happens. 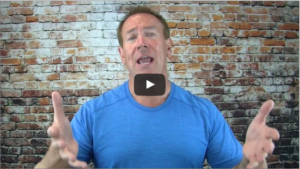 Every once in a while, even if you’re doing really good marketing for your auto repair shop, you’re going to run into those slow periods that you didn’t expect. So, of course, this guy being a long-time client, he’s been with me for about six years, I went to my go-to strategy to get instant car count. What is it? Well, it’s text messaging. You’ve heard me talk about text messaging on earlier videos, but this particular phone call, the unfortunate thing is I’ve had phone calls like this over and over and over again because as soon as I mention the quickest way to get cars in the shop that I’ve been mentioning for six years, I say, “Text messaging.” There’s a pause on the other end and I know exactly what’s going to happen because I’ve seen it happen so many times. The question is, “Oh, yeah. Yeah. Tell me about this text messaging. How does that work?” Well, it’s almost comical now. It still drives me crazy to hear that. But, look, even though I’ve been talking about this for over eight years, using text message as a very viable means of getting quick car count to your shop, a lot of people, including my own clients that have heard me sing that same song over and over and over simply aren’t prepared to use that strategy when they most need it. So, in his particular case, it wasn’t the technology of trying to figure out how to physically send out the text message to a group of people. It was the fact that he has not been collecting those numbers from his clients. Okay, now you can’t send out text messaging to people that are not your own clients, so throw that out of the mix. These are people that have been in the shop in the past and he’s seen them over and over and over. I guess the purpose of today’s Car Count Daily is to get you to be prepared. There are things that you have to do right now if you want to use them in marketing later on. Collecting text numbers is number one. That’s the quickest and easiest way to get people in. But, unless you go through the gyrations, ask people and poke and prod and promote to people to give you their cell phone number so you can send them text message, you won’t be able to use that strategy. Okay, so this particular shop owner was kind of left hanging because the best strategy that would have gotten his phone ringing immediately after sending out the text message, most text messages are read within 15 of them being sent out, so the phone starts to ring immediately when you start using that for marketing. He didn’t have anybody to text to. He had over 1000 people in his database, but he hasn’t been real diligent on collecting those numbers. So, here’s the key for today: start now. Whether you think you’re going to use text now or in the future, start now and start collecting those. It’s the same with email. You can’t send out an email campaign unless you have collected email addresses. You can’t send a mailing piece unless you’re actively collecting their regular snail mail address. Prepare for marketing. Marketing isn’t something that you think about and just do on a last minute. I mean, that’s the key here. That’s the reason why we have this Car Count Daily every single day to keep your mind energized and focused on marketing, so that you do marketing every single day. The more marketing … It doesn’t have to be a lot every single day, but think about the marketing, prepare for the marketing every single day and you’ll never have a car count problem in the future, okay? So, start collecting those text numbers. Start collecting those emails. Start collecting those snail mail address. Whether you plan to use them right now or not, you’re going to need them later on, I guarantee it. That’s going to do it for today, but before you go, please do me a favor. Go down below this video and let me know what you think. Let me know what you think about these Car Count Dailies. Let me know if there’s something you’d like me to cover sometime in the future. And somewhere on this page you might even find an advertisement for a webinar that we have coming up, because we’re constantly giving more and more good quality information out there. And if you want to stay connected, go ahead, write me something. 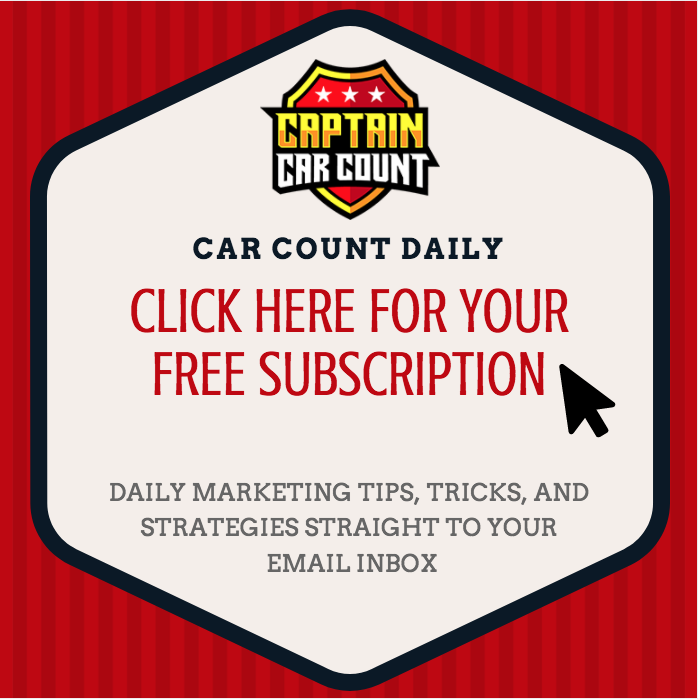 Make sure you’re part of our Car Count Daily email lists, so you get these every single day and sign up for the webinar if we have one going on right now. And again, it’ll be somewhere on this page. Go ahead and sign up for it. You’re going to get a lot of great information. Great idea. My customer get upset about text messaging. We call them and we email them and we should text them, they almost see that as a form of harrasement. Thank you for sharing such a useful blog, which provides some very important information to increase the car count in repairing shop. The car count could be increased in the repairing center by providing better service to the customer at an affordable price. Customer prefers to do some research works on the repairing center. So, suitable steps should be taken to gain more positive reviews on the internet. Repairing centers should be customer friendly. i have emailed you many time with no replay. can you help workshops outside the US ?